Sunday November 20 1910 26 years today Charlie & Ida were married. I went to church and came home in rain. It soon turned to snow. I was busy most of the short afternoon and read all the evening. 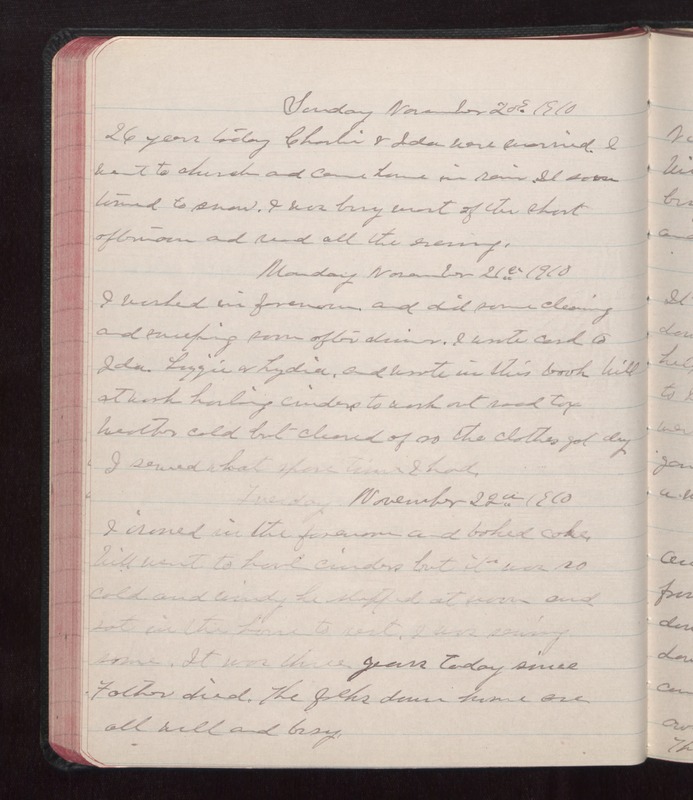 Monday November 21 1910 I worked in the forenoon and did some cleaning and sweeping some after dinner. I wrote card to Ida, Lizzie & Lydia, and wrote in this book Will at work hauling [cinders?] to wash out road [tax?]. Weather cold but cleared of so the clothes got dry I sewed what spare time I had. Tuesday November 22 1910 I ironed in the forenoon and baked cake. Will went to haul cinders but it was so cold and windy he stopped at noon and sat in the house to rest. I was sewing some. It was three years today since Father died. The folks down home are all well and busy.